Fortunately, there are strong, comfortable, stylish frames now made for children. These glasses not only improve vision, but they look great. We carry a broad selection of designer frames for kids including Guess, Sketchers and Jelly Bean. When buying a pair of eyeglasses for your child bring them along. Your child should like how the glasses look and feel. 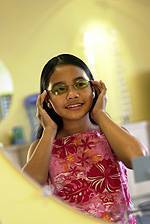 At TSO Greenspoint, we carry a wide selection of children’s frames including designer frames Jelly Bean, Skechers and Guess Kids.